Em’s father’s health had been failing for some time, but by the fall of 2001 he seemed more stable. In light of his improvements, we prepared for our routine trip back to Italy. When we left the US, Harry was out of the hospital. He had been given an oxygen tank, but was mobile and comfortable. We were hesitant to leave, but felt that staying; watching, and waiting could gain nothing for anyone. But Harry was in our thoughts. When we arrived in Italy we began writing this song as a meditation to release Harry from this earth. Our hope for him was that he would go peacefully rather than continue his tormented routine of emergency ambulance runs. We finished the song as a reflection of our feelings and the observation that as babies, we are held and rocked. 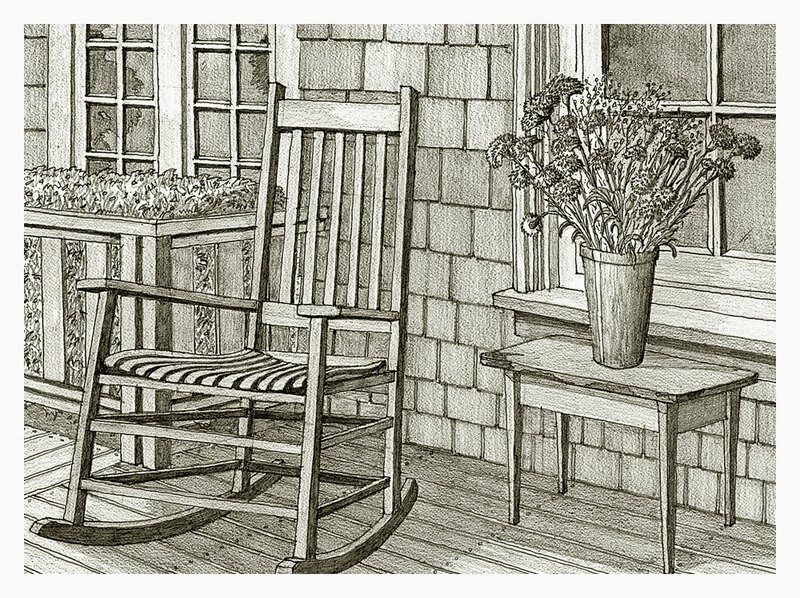 Then as aged adults, we find ourselves back in the rocking chair, this time alone, rocking ourselves. In each case, comfort is the primary intention. Then one day, Cheryl was at SACI working while Em was at the apartment in Fiesole. He happened to be sitting at the living room table across from Pietro, talking, when the phone rang. Pietro answered it, immediately handing it over to Em, saying it was our son, Aaron calling. Em took the phone, anticipating Aaron’s message. As expected, Harry had died in the night. There were no words as Emerson broke down sobbing. Em collected our passports and went to pick Cheryl up at the arranged time outside the Duomo in Florence. He was sitting against the Baptistry when she arrived in the Piazza. As the bus approached, she read his body language and knew immediately what had happened. We drove to the airport and booked a flight for the next day. We hoped that in some small way through this song, we had helped to “rock Harry to sleep.